Recently I attended an in-service training day at the community college where I teach anthropology. This is interesting because A) they brought in a corporate communication coach to talk to us about dealing with difficult people and B) I relayed the coach’s strategies to my mother. This lets them know that you hear them, that you are on their side. Once you’ve made this initial connection, you move on to Step 2. But then I tried it. And you know what? It worked. I’ve been able to convince my students to actually complete the assigned reading, to study before their exams, to practice when they have to give an oral report, and so on. The best part is that whenever I share a “success story,” the student in question has a total epiphany and says, “Oh! Yeah, I guess I could do that!” They get all smiley and walk away thinking that they’ve just stumbled upon the greatest idea in the history of the universe, when in fact it was skillfully implanted by Yours Truly. 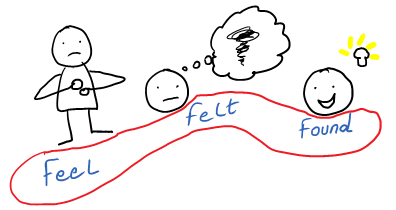 My mother, mind you, does not teach at a community college but I figured I’d share the genius of the Feel, Felt, Found system so that she could adapt to her own purposes. Mom: I feel like she’s an idiot! Me: That’s not it. You’re supposed to talk to her. Me: You can’t call someone an idiot when you’re using Feel, Felt, Found. It closes the lines of communication. Mom: Others have felt that you’re an idiot too? Me: That’s a little bit better. She’s not quite there yet, but I have hope. (1.) Did you eventually get Abuela’s clothes retrieved from that relative? (2.) Did you tell Abuelo, a few months ago, what “others have found” about closing bathroom doors?